Why should corporations have rights, like people do, but the natural environment in a capitalist society seems to have no rights at all? We’ve changed that in Santa Monica, with a pioneering law our City Council passed on my motion: our Sustainability Rights Ordinance. In March of 2013, after many months of community work to create a more level legal playing field between corporations and environmentalists, Santa Monica adopted California’s first Sustainability Rights Ordinance. This law asserts the fundamental rights of all Santa Monica residents regarding sustainability. The ordinance also establishes the rights of natural communities and ecosystems to exist and flourish in Santa Monica and asserts the rights of residents to enforce those rights on behalf of the environment. The ordinance establishes that corporate entities do not possess special privileges or powers under the law that subordinate the community’s rights. Does all that sound to good to be true? The language is taken directly from the detailed and supportive staff report submitted to the City Council, based on the work of community members and hearings held by our Santa Monica Task Force on the Environment. You can read the entire staff report here. This law specifically protects groundwater aquifers, atmospheric systems, marine waters, and native species of plants and wildlife. We wrote it in the hope that other communities will adopt such laws, and we can create environmental and sustainability protections at the local level that may take many years yet to achieve at the state, federal, or global level. One community at a time! The ordinance passed again on second reading, and became fully effective on May 9th, 2013. At least one Councilmember in neighboring Culver City is interested in “borrowing” our law, which brings up one reason many worried communities might be interested: Our law could be used to stop fracking. Interested? The entire text of the ordinance is below, or, if you need the actual City web page that contains the adopted ordinance, you can find that here. WHEREAS, the City is committed to fully implementing its Sustainable City Plan to further effectuate inherent rights of the people and natural communities of the City of Santa Monica. This chapter shall be known as the City of Santa Monica Sustainability Rights Ordinance. (e) The inadequacy of the current framework of state, national and international policies and laws necessitates re-examination of the underlying societal and legal assumptions about our relationships with the environment and a renewed focus on effectuating these rights. This Chapter is created and exists for the purpose of codifying Santa Monica's commitment to achieving sustainability by among other things: (1) restoring, protecting and preserving our natural environment and all of its components and communities including, but not limited to the air, water, soil, and climate upon which all living things depend; (2) creating and promoting sustainable systems of food production and distribution, energy production and distribution, transportation, waste disposal, and water supply; and (3) to the full extent legally possible, subordinating the short term, private, financial interests of corporations and others to the common, long-term interest of achieving environmental and economic sustainability. (a) All residents of Santa Monica possess fundamental and inalienable rights to: clean water from sustainable sources; marine waters safe for active and passive recreation; clean indoor and outdoor air; a sustainable food system that provides healthy, locally grown food; a sustainable climate that supports thriving human life and a flourishing biodiverse environment; comprehensive waste disposal systems that do not degrade the environment; and a sustainable energy future based on renewable energy sources. (b) Natural communities and ecosystems possess fundamental and inalienable rights to exist and flourish in the City Of Santa Monica. To effectuate those rights on behalf of the environment, residents of the City may bring actions to protect these natural communities and ecosystems, defined as: groundwater aquifers, atmospheric systems, marine waters, and native species within the boundaries of the City. (c) All residents of Santa Monica possess the right to self-governance and to a municipal government which recognizes that all power is inherent in the people, that all free governments are founded on the people's authority and consent, and that corporate entities, and their directors and managers, do not enjoy special privileges or powers under the law that subordinate the community's rights to their private interests. At least once during every 24 month period, City staff shall prepare a written report to the community on the state of the local environment, the realization of the rights recognized in Chapter 4.75, and the City's progress in effectuating and enforcing the Sustainable City Plan and the policies and provisions of this Chapter. The report shall include recommendations for advancing and ensuring compliance with the Sustainable City Plan. 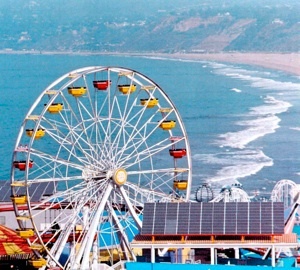 The City Council will bi-annually review the report, conduct a public hearing, assess the City's progress in effectuating and enforcing both the Sustainable City Plan and the policies and provisions of this Chapter, and provide direction to staff to ensure compliance with the Plan’s provisions and with the inherent rights of the people and natural communities of the City of Santa Monica described herein. The City or any City resident may bring an action to enforce any provision of the Santa Monica Municipal Code that advances the goals identified as enforceable in the Sustainable City Plan. Section 2. Any provision of the Santa Monica Municipal Code or appendices thereto inconsistent with the provisions of this Ordinance, to the extent of such inconsistencies and no further, is hereby repealed or modified to that extent necessary to effect the provisions of this Ordinance. Section 3. If any section, subsection, sentence, clause, or phrase of this Ordinance is for any reason held to be invalid or unconstitutional by a decision of any court of competent jurisdiction, such decision shall not affect the validity of the remaining portions of this Ordinance. The City Council hereby declares that it would have passed this Ordinance and each and every section, subsection, sentence, clause, or phrase not declared invalid or unconstitutional without regard to whether any portion of the ordinance would be subsequently declared invalid or unconstitutional.